With a newer camera, you may be overwhelmed with the large amount of information about each shot that the camera provides on the LCD screen and (possibly) through the viewfinder. It can be tough to figure out what your camera display is exactly showing you. Learning what all of the information means can help you use the camera more effectively, as shown by these tips for deciphering the camera display screen information. An “F” or an “f/” followed by a number refers to the aperture setting (or f-stop) for the photo. A larger aperture (signified by a smaller “F” number) allows more light to reach the image sensor, allowing for faster shutter speeds. In addition, a larger "F" number will allow a larger depth of the photo to be in focus. A smaller "F" number means a small portion of the depth of the photo will be in focus, meaning only the subject may be in focus, and the background will be blurry. A number listed as a fraction like 1/2000 or 1/250 represents the shutter speed in a fraction of a second. A shorter shutter speed makes it easier to capture moving subjects. You may find that some cameras list the shutter speed as a single number, such as 2000 or 250, rather than a fraction. It means the same thing as the fraction. A segmented line that looks a little like a ruler or tape measure usually is the exposure or white balance indicator. A plus/minus icon can refer to a couple of things with your camera settings: Exposure compensation or flash compensation. A number inside a set of parentheses usually refers to the number of photographs you can still shoot at the current resolution before the memory card is full. Some cameras list this number without parentheses too. Look at the portion of the screen where the camera's resolution is listed, and you'll usually see the number of photos remaining listed nearby. You'll usually see the movie resolution listed near the still image resolution as well. After the movie resolution, which may also include listing the number of frames per second at which you're shooting, you should see a listing for the amount of time remaining on the memory card for video recording. This number will be listed most of the time as minutes and seconds, with the minutes number followed by an apostrophe and the seconds number followed by a quote mark. A number next to an “ISO” icon refers to the camera’s ISO setting. Higher ISO settings are required for shooting in less external light. A QUAL icon or a number with an “M” icon, such as 10M, refers to the resolution and image quality for the photo. L typically refers to the largest resolution number, while S refers to the smallest resolution. 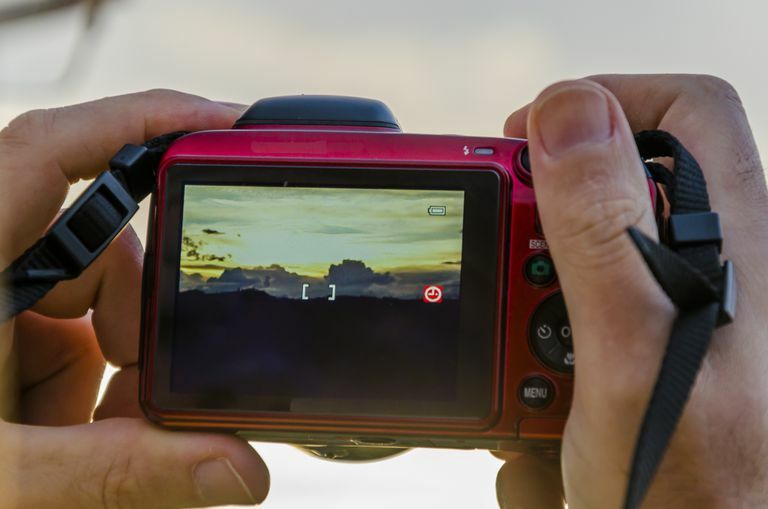 Because most DSLR cameras have a viewfinder, you usually can choose to have the LCD display the camera’s settings information or the “live” view of the photo you’re going to shoot. With some cameras, you are able to change the information shown on the display. Look for a button with an “i” or “INFO” marked on it. Pressing this button should change the information on the display. Depending on the camera model, you also can specifically select the information that will be displayed through the camera’s various menus.